​Driving Question: What is the effect of increasing academic oral language on oral reading fluency as measured by Dibels Oral Reading Fluency test? Abstract - Approximately 25% of students in California identify as English Language Learners. In 2013-2014, ELLs scored only 41 percent proficient or advanced compared to English-only students scoring 65 percent proficient, a difference of 24 percentage points. In various studies about the effect of oral language on reading skills research has found that reading fluency was a powerful predictor of reading comprehension. Yet, for ELL student oral language skills also play a key role in reading acquisition. For the scope of this action research, specifically how will increasing academic oral language affect reading fluency? To increase academic oral fluency, students were provided with sentence and response stems that included academic language related to content and academic language functions which would include summarizing, analyzing, questioning and clarifying. This mixed methods study design analyzed quantitative data from reading fluency tests and qualitative data based on student responses in a discussion group. Students showed an average of twenty words per minute growth between the pre and post reading fluency test. 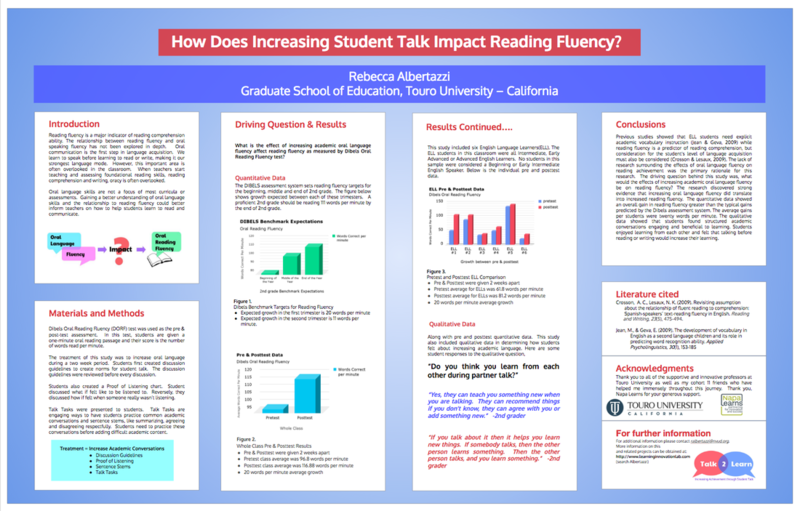 The study showed a positive relationship between academic oral fluency and reading fluency. Reading fluency has become very important skill in schools and has even been determined to be a major indicator of reading comprehension ability. the increase in numbers of ELLs to our schools, reading achievement and instruction has been a primary concern for our nation’s schools.On the Nation’s Report Card, America’s 4th-grade English-only students achieved an average scale score of 226 in the area of Reading whereas ELLs in 4th-grade score 189, a 37-point difference. In 2013-2014, 22.7% of students in California were identified as English Language Learners (http://nces.ed.gov). This is the largest percentage for any state in the U.S. Seventy-three percent of these English Language Learners are in elementary grades K-5. In California, the English-only students averaged a proficiency scale score of 224 and the ELLs averaged 183, a 41-point difference. This score falls at the bottom of the basic range. The achievement gap in California is magnified due to the large percentage of ELLs who populate its schools. The Annual Measurable Achievement (AMAO) Objective 1 goal measures a year’s growth in language acquisition based on CELDT testing, 21% percent of 4th graders, 12% of fifth graders not meeting their language acquisition goal. These same students that are struggling with language acquisition are also struggling readers. In order to be redesignated and considered English proficient, students must be at an Advanced or Early Advanced phase of acquiring English as measured by the CELDT test. The CELDT test measures reading, writing, listening and speaking. The students must also be considered proficient on Dibels or Proficient on the SRI. Click here to review the academic research papers that inspired my action research paper.